Ricky Wysocki and JohnE McCray made history as the first players from Team Latitude 64° to win a PDGA World Champion title. Ricky in Open and JohnE in Masters. To celebrate this we have commisioned these discs. 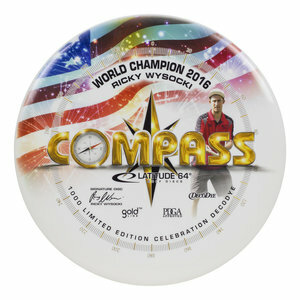 1000 of the Ricky Wysocki Compass has been made. 400 each of the JohnE McCray Harp and Saint Pro has been made.